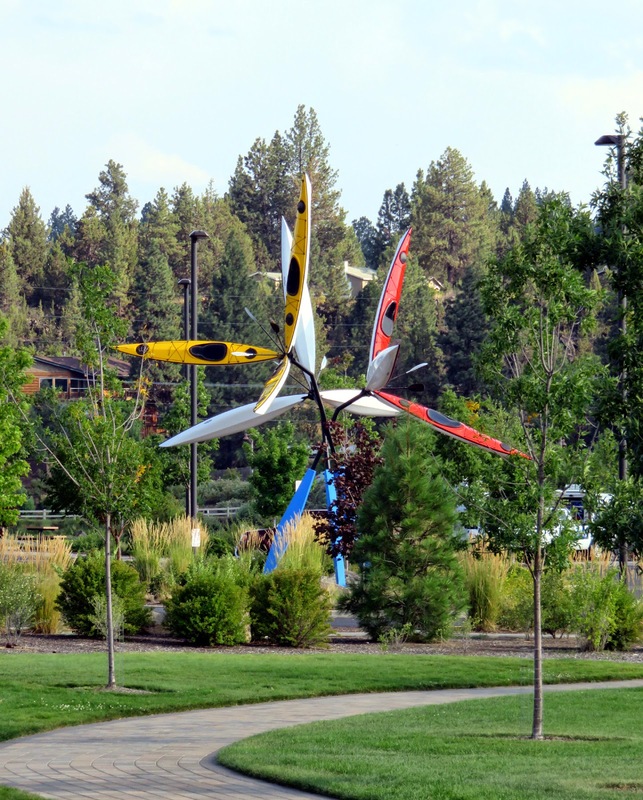 Steve and I had a fabulous week in Oregon ... using the IQF (International Quilt Festival)'s Quilt! Knit! Stitch! show at the Portland Convention Center as our excuse for the trip. 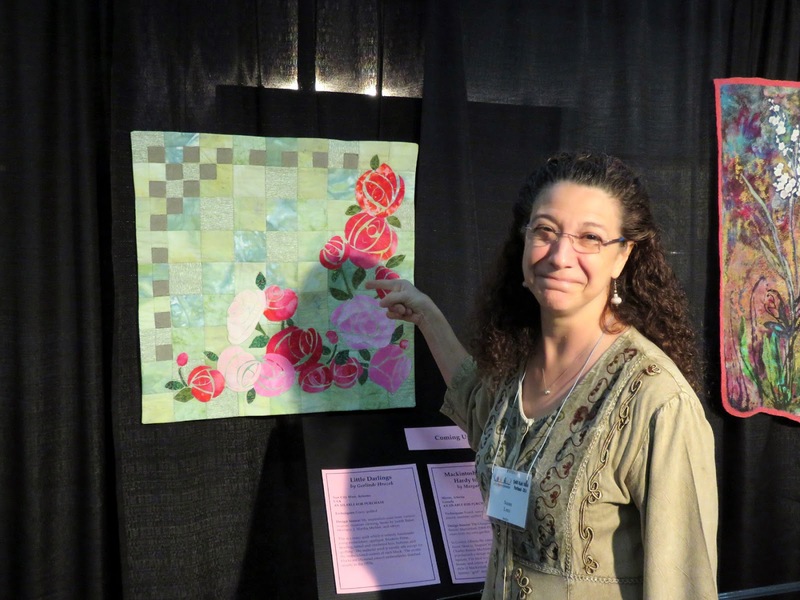 Of course the quilt show was wonderful. I even greeted people and gave a brief talk about the merits of membership in SAQA (Studio Art Quilt Associates) ... while helping man the two juried SAQA shows: Metaphors on Aging and Text Messages. I have a piece in each of these two exhibit. I met some really great ladies, including Elizabeth Bamberger (above) who headed up the SAQA volunteers. I also got to see a cyber friend's art quilt ... this fantastic piece by Margaret Blank (above). While I was busy, my husband Steve wandered around. It was so exciting to then have him show me what pieces impressed him most. Looking at the exhibits through his eyes was quite thought provoking but his observations in the vendor area were down-right hilarious. 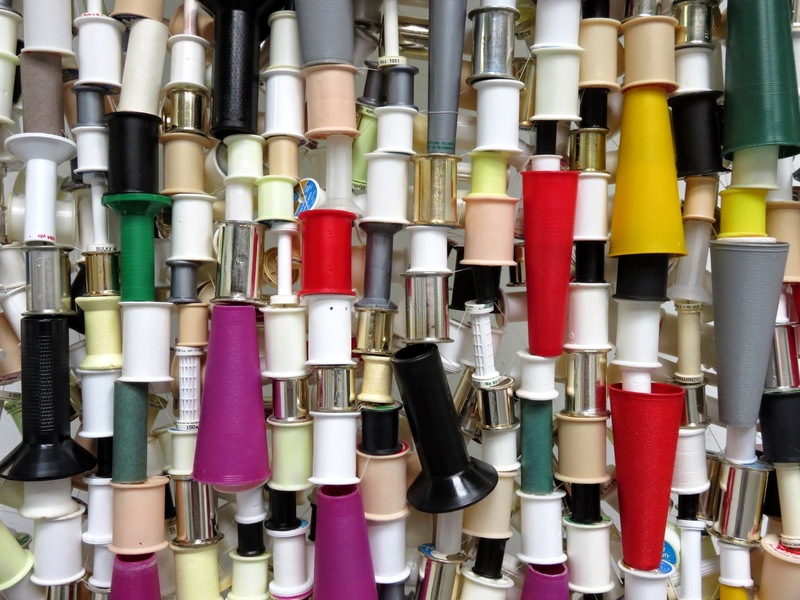 He said to me, "Susan, I think you might like this one booth selling thread." (Really? LOL!) Amazingly, he took me to Superior Threads and showed me the 2000 yards cones of variegated, #40/3-ply Egyptian-grown extra-long staple cotton quilting thread. Oh yes! He seems to know exactly what I like ... and I got nine cones at a nice discounted price! 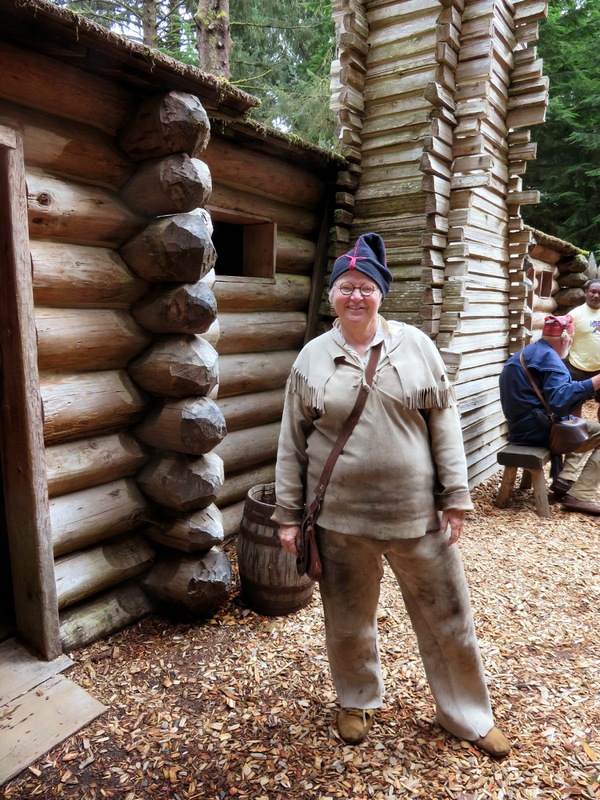 From Portland we drove to Astoria and visited with our friend Jan Merling who is working as a seasonal docent at Fort Clatsop, part of the Lewis and Clark National Park. 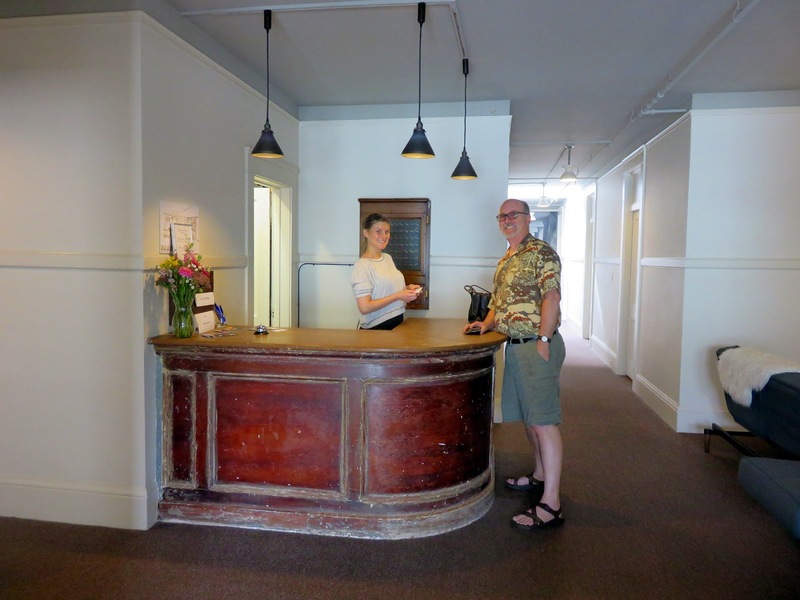 We stayed at the Norblad Hotel and Hostel. It is a fabulous place. 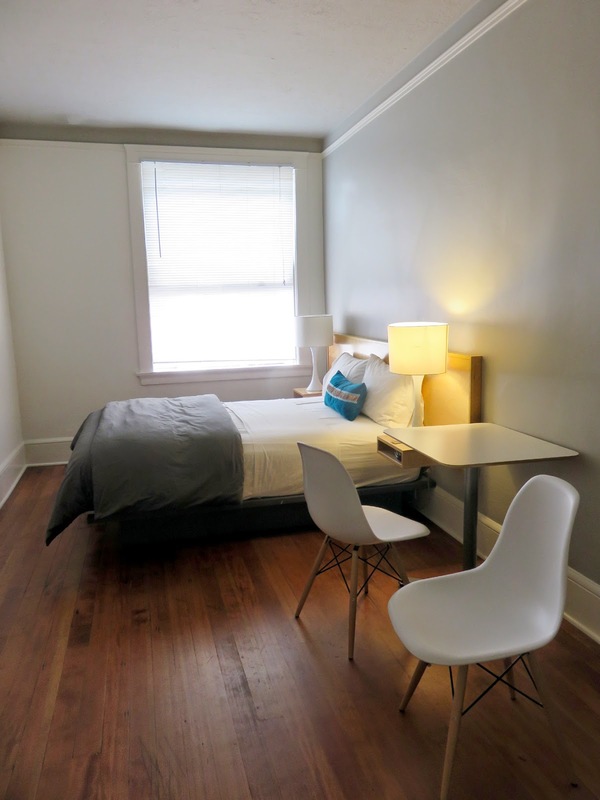 I know too many people who won't stay in a location that is even vaguely associated with the notion of a "youth hostel" and will not consider a room that doesn't have its own bath. I'm not one of these people. I loved having provided white, terry cloth robes to walk down the hallway to a shower. This place was nearly half the price of the chain hotels and in a far better location! They even passed out free postcards! 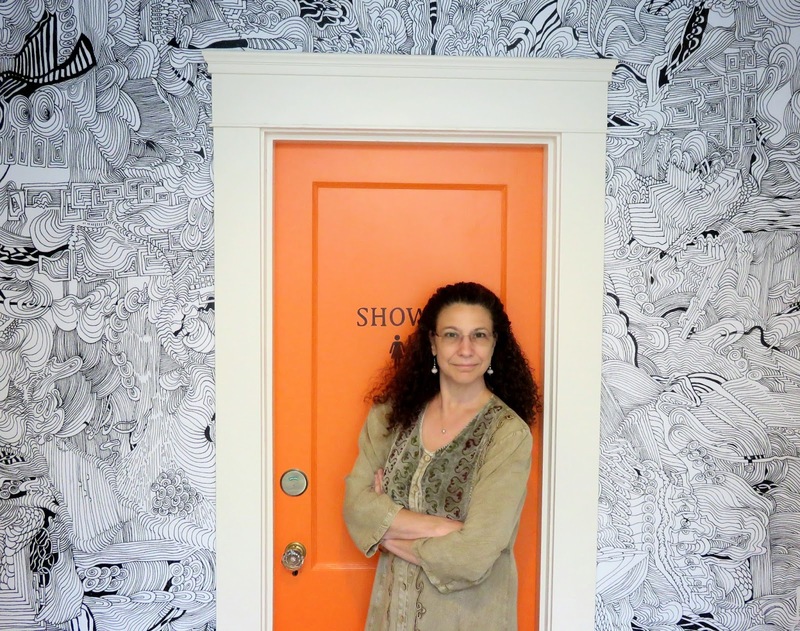 One of the postcards featured the artist who decorated this wall to one of the showers. I had to assume the same pose. Quite cool ... and yes, all the doors were signature orange. 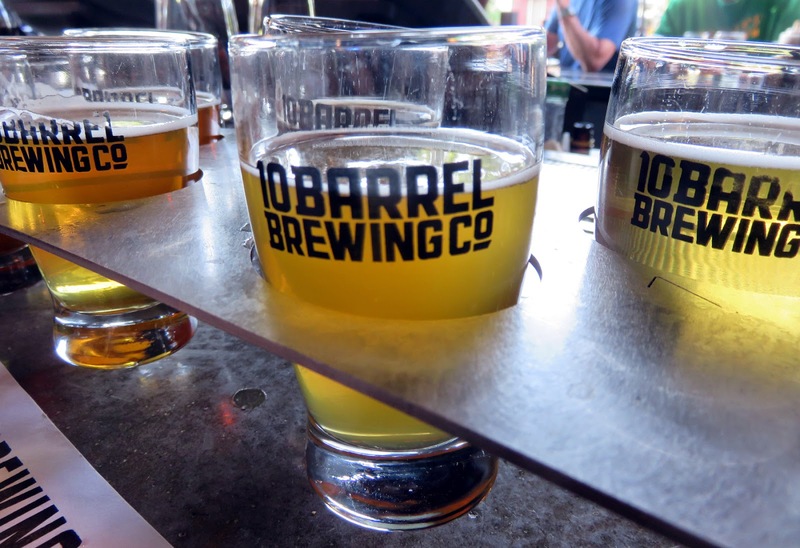 Everything was immaculately clean, quiet, and the staff was friendly and helpful ... by directing us to dinner at the brew pub across the street. 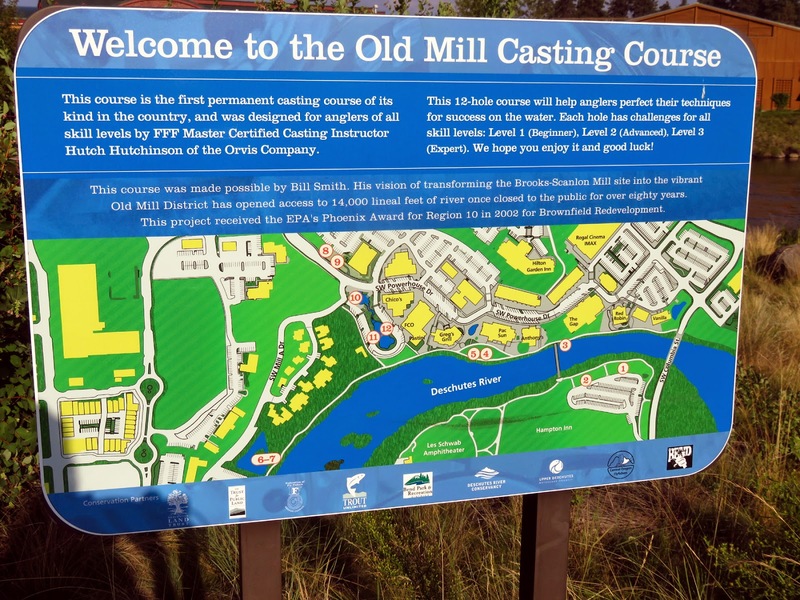 ... and the river's edge included a "casting course" for people to practice their fly fishing techniques! 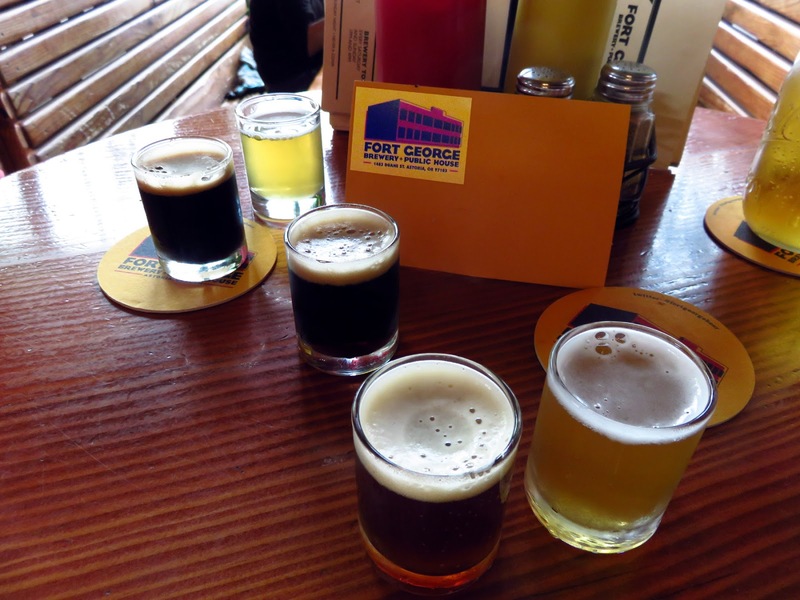 Of course, Bend, Oregon was almost at the end of our vacation. 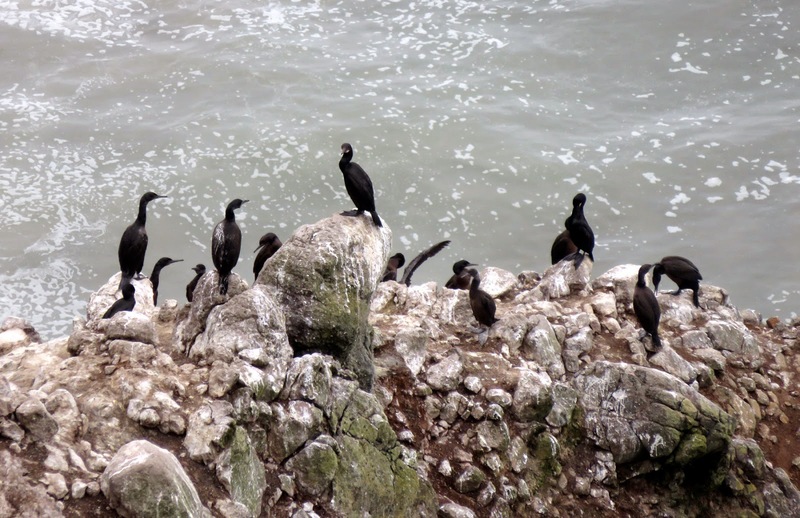 Before getting there, we drove the rocky coast line ... stopping at some of the hundreds of provided viewing areas to admire the beach, the morning's fog, the mountainous terrain ... and the cormorants. 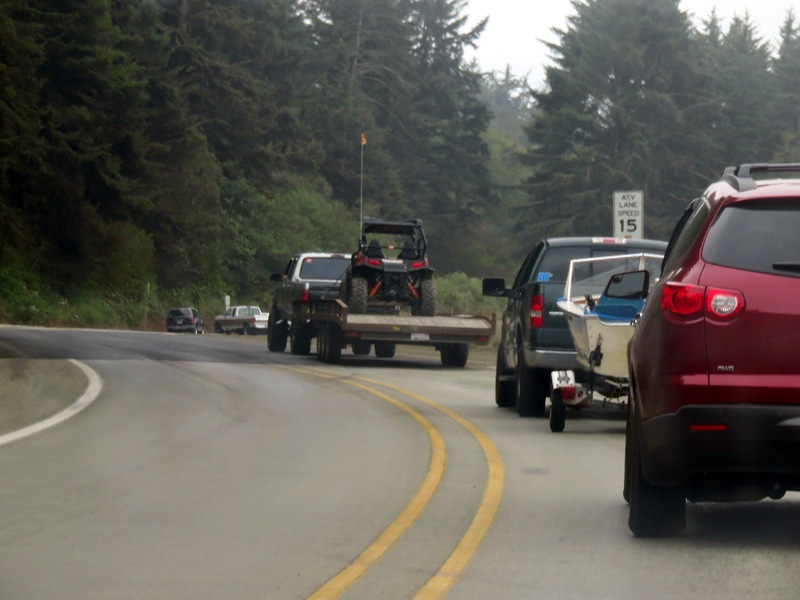 We had a splendid day at Winchester Bay ... on the sand dunes (which is at the end of this blog post) and traveled over gravel roads into Grant's Pass before going to Crater Lake. 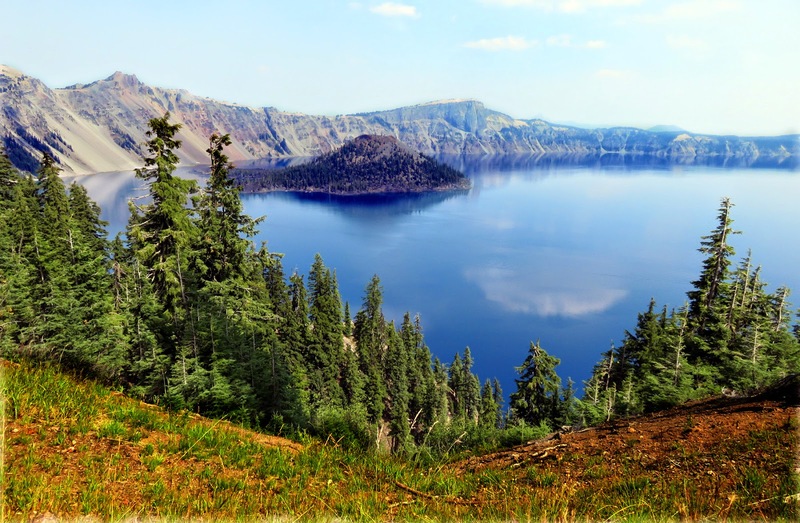 Crater Lake is undoubtedly one of the earth's most beautiful spots. Steve and I visited there a couple of years ago ... on November 1st. At that time, the rim road was already closed for the season as there were several of feet of snow on the ground. It was gorgeous but we really wanted to return when the weather permitted more access. Well, the weather during this latest trip was fabulous! 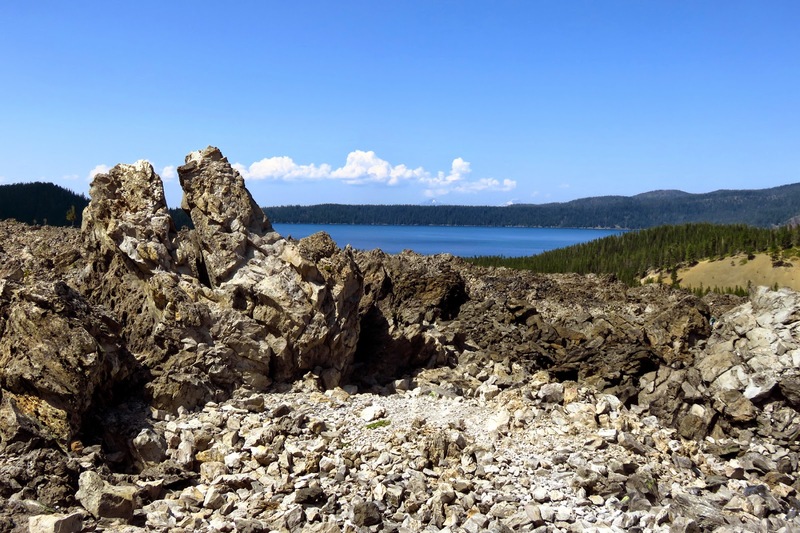 We drove the northern rim to a very full parking lot by the Cleetwood Cove trail. 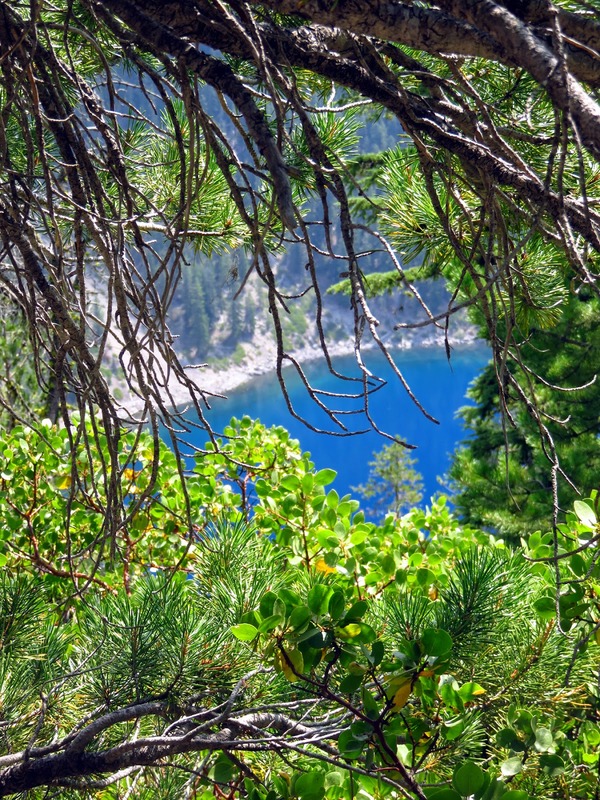 This 2.2 round-trip hike is the only place to descend to the water's edge. On the dock are boats that ferry people to Wizard Island. It is steep ... as in VERY, VERY steep ... as in totally downhill. The trek back up is strenuous ... as in totally UPHILL. It was worth every step! ... even though the view in front of me wasn't bad either! LOL! These five, shirtless Brazilian engineering students (who spoke perfect English and knew that they nearly derailed every female coming up the path) were ready to jump into the 38 degree chilly waters. They were equipped with a mono-pod for better group "selfie" photos and a waterproof camera to record their antics. Their trunks sported designer labels and even their flipflops said Abercrombie & Fitch. Walking downhill after them was not a problem at all. 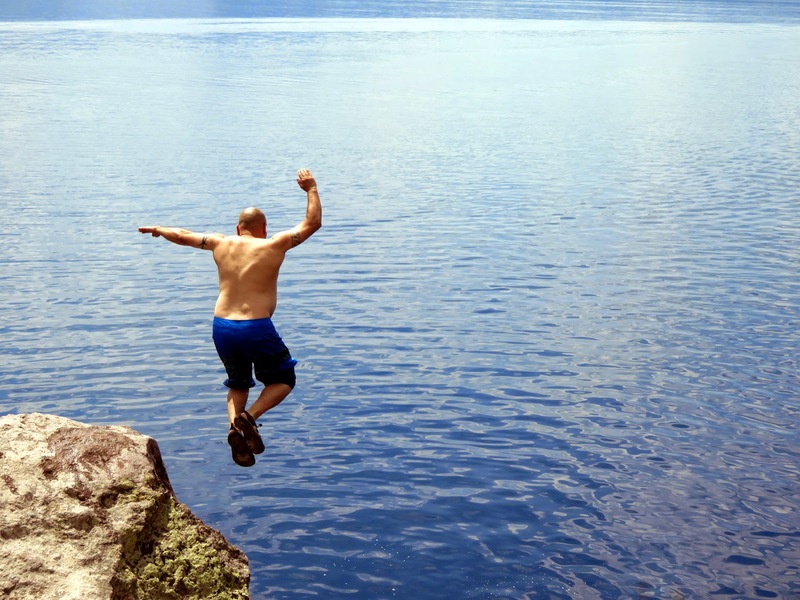 Initially Steve and I thought only such youth would be jumping into the lake. We were excited that these five fellows were going to do it. Little did we know that people from just about every walk of life were jumping off the twelve foot escarpment ... including this tattooed motorcyclist ... Moms and Dads ... old and young ... foreign and native ... and I really wished I'd brought a swimsuit too. 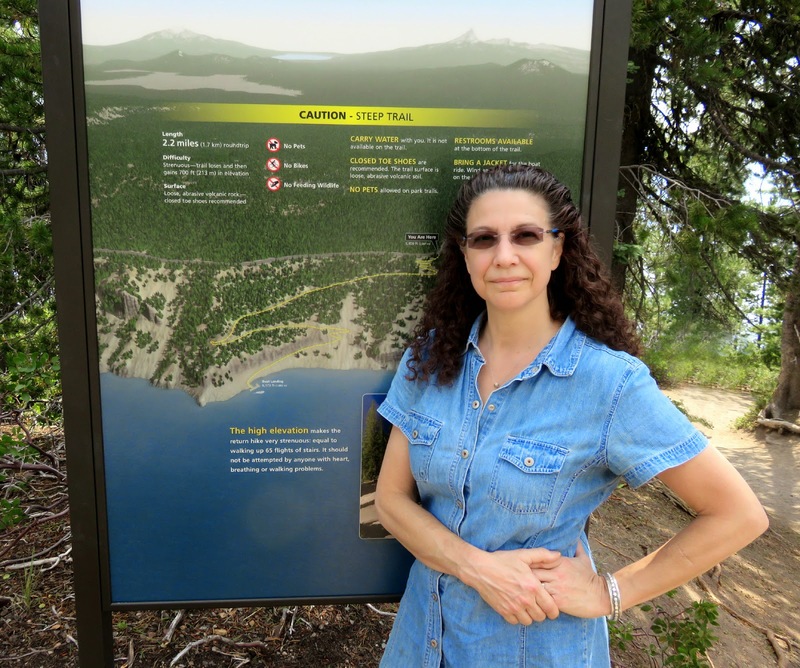 Okay ... some people were jumping into Crater Lake in their clothing but I wasn't about to walk up the 1.1 steep trail in a wet denim dress and I really thought I ought to spare people from seeing me in my underwear! 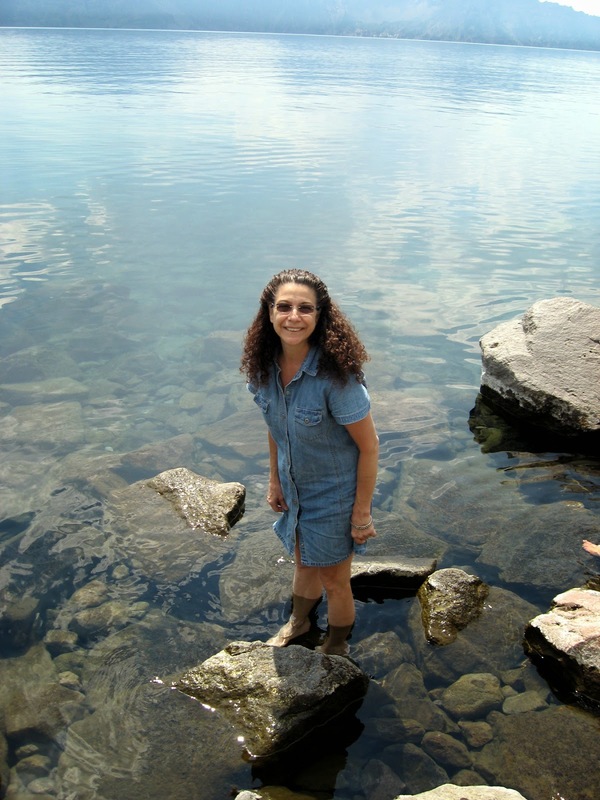 Yet, I couldn't resist a little wading! If there's a "next time", I'm jumping! Along the ascending trail, Steve and I took several breaks due to the steepness. 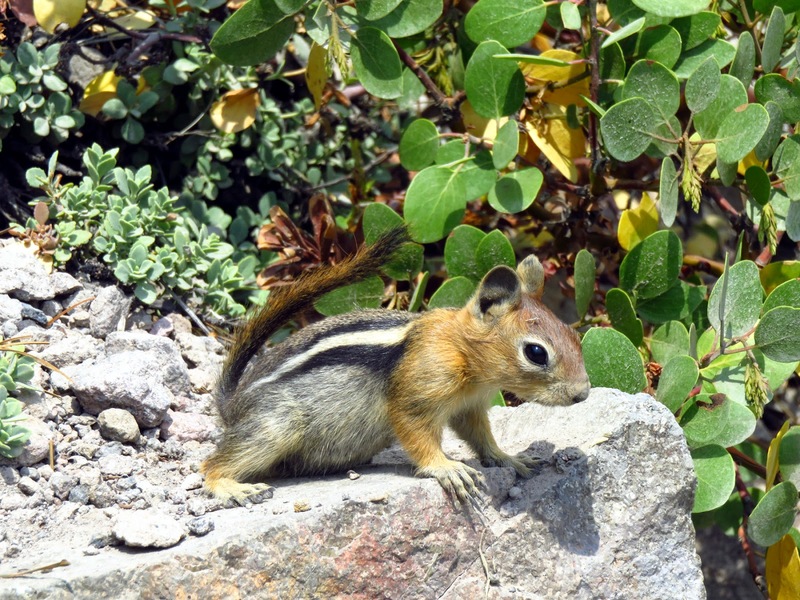 I used those moment to attempt capturing one of the Golden Mantled Squirrels on camera. I must have shot three dozen photos but at least this one turned out! Isn't he cute? 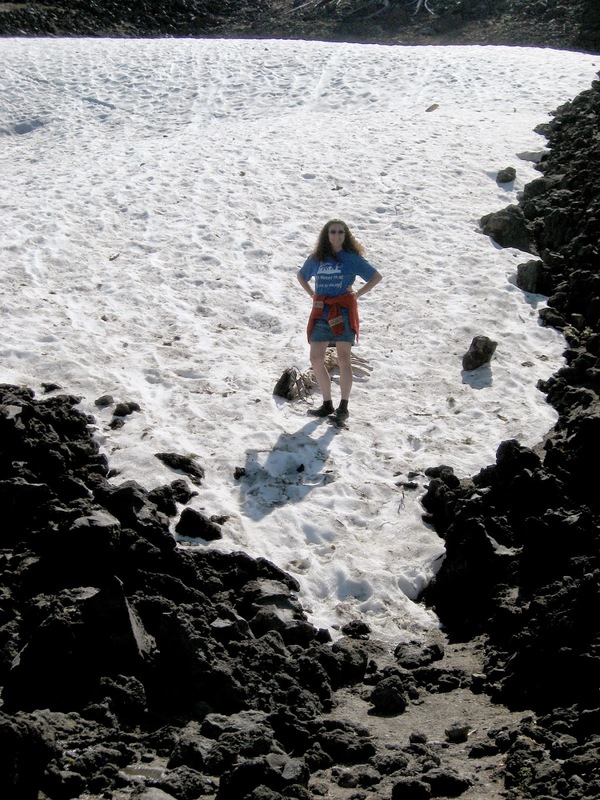 There is a trail circumventing the entire rim of Crater Lake ... but we aren't backpackers. The road for vehicle traffic (which is actually lots shorter than the expansive trail system around the volcano) is 29 miles. 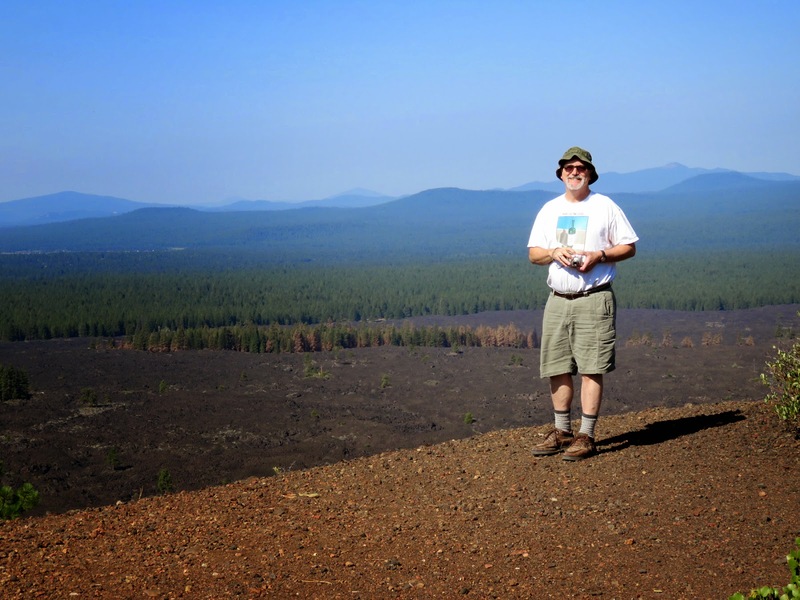 Steve and I were much happier at Lava Butte near Bend, Oregon. This conical vent is almost perfectly like a child's rendering of a volcano. There's a road to the top and it only takes about ten leisure minutes to walk the rim. 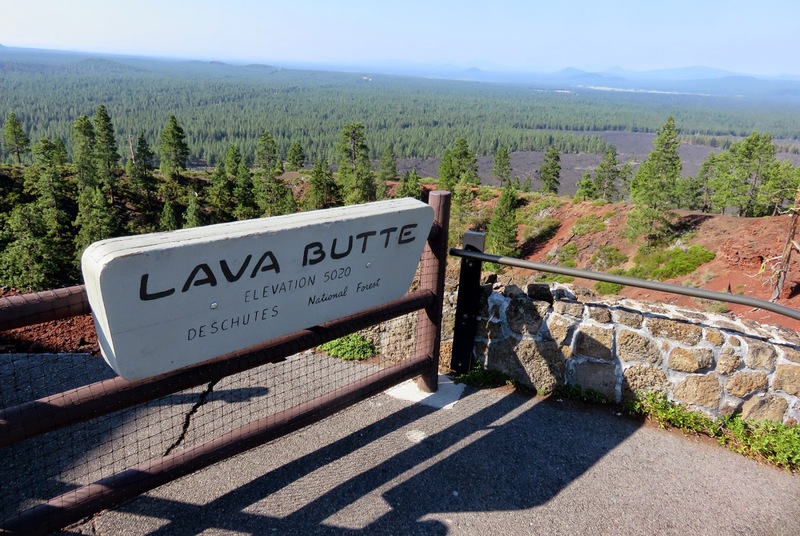 Yet, the lava flow was once tremendous and can be seen in all directions ... for miles. The power of nature is obvious! The views were terrific! 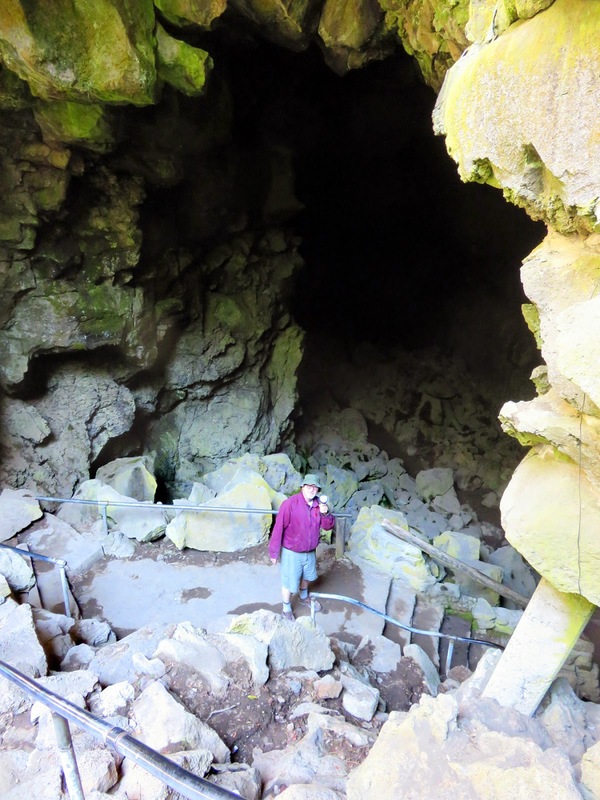 Nearby is the Lava Tunnel Cave. It is a perfectly intact lava tube ... for an unlit mile underground. People rent lanterns and/or flash lights. There is really no "path" but the bumpy remains of earth after all the lava oozed out. The experience was unique. We often felt like we were the only ones stumbling around in the dark, as if original explorers! 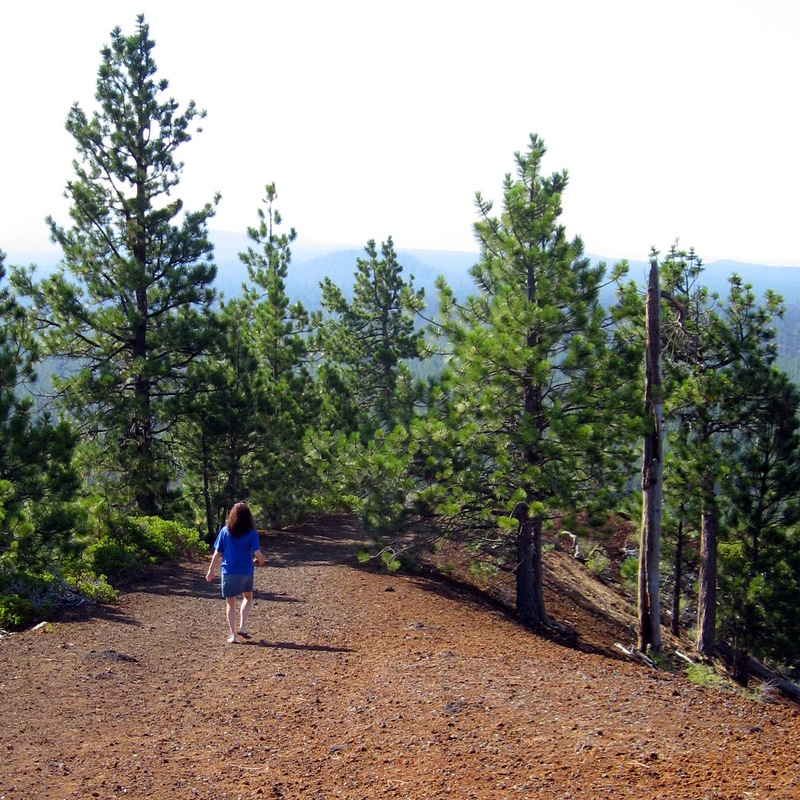 Another amazing experience was hiking the trail over the "Big Obsidian Flow" at nearby Newberry Crater. Like most of the other craters, this is still an active volcano ... and this one is about the size of Rhode Island with a caldera that covers just over 17 square miles. The last eruption was 1300 years ago. 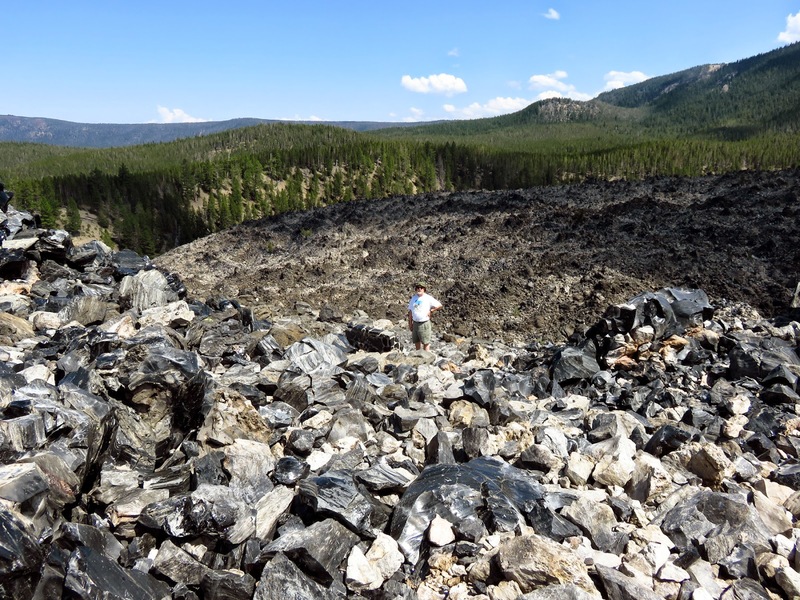 That eruption created the Big Obsidian Flow. 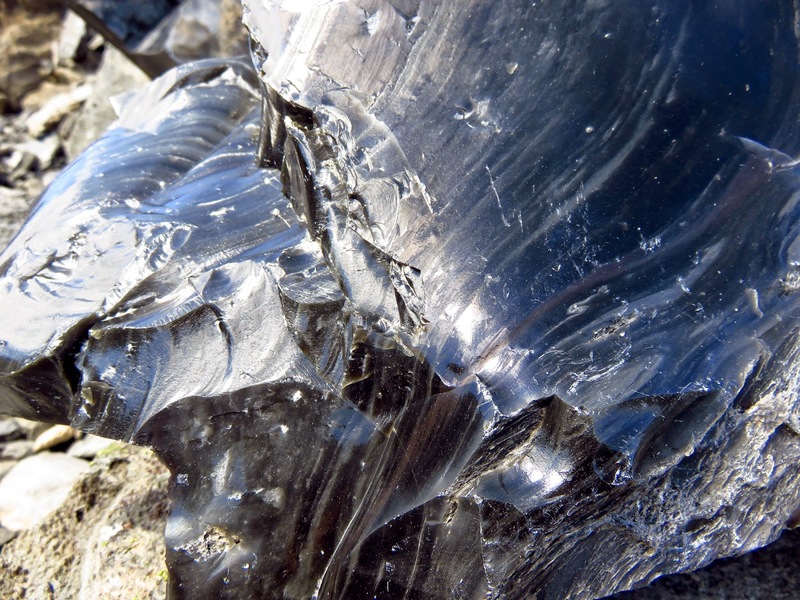 Obsidian is rare ... worldwide. Here, however, the accumulation is massive ... as in over a square mile at a thickness of 17 stories in height. Roughly 80% of the flow is pumice. 20% is the black, cooled glass. No dogs were permitted on the trail because ... well ... the glass can really damage a pet's paws. It was hard not to be impressed with the details but also the overall landscape. In the middle of the shot above is Steve! 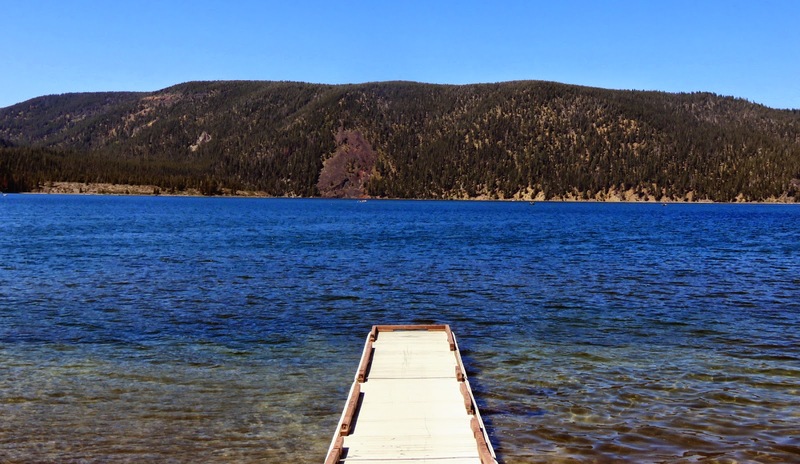 There are two lakes in the collapsed caldera at Newberry Crater including East Lake where the water was quite clear and there were plenty of minnows. 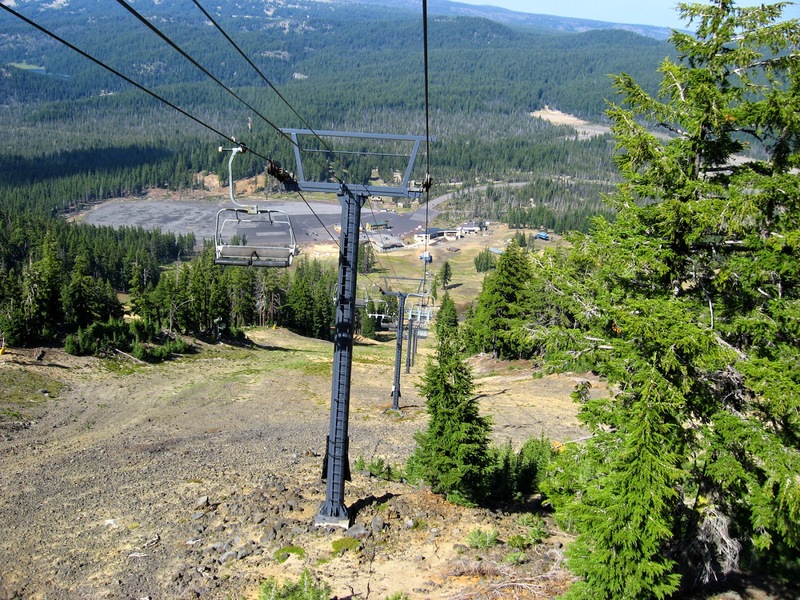 ... and took the chairlift to near the summit. Many mountain bikers were doing the same. 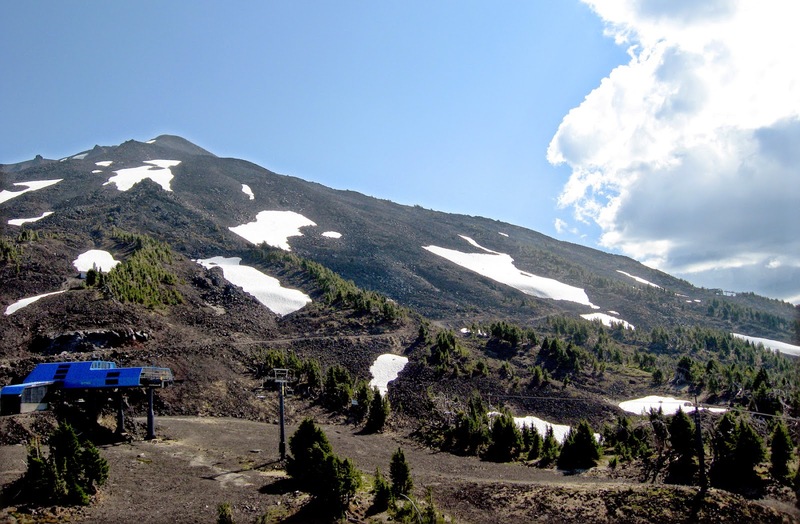 Due to the hard, volcanic soil, the ski slopes are turned into an amazing mountain biker's summer paradise. We didn't do this ... which is likely why we lived to tell about the experience! 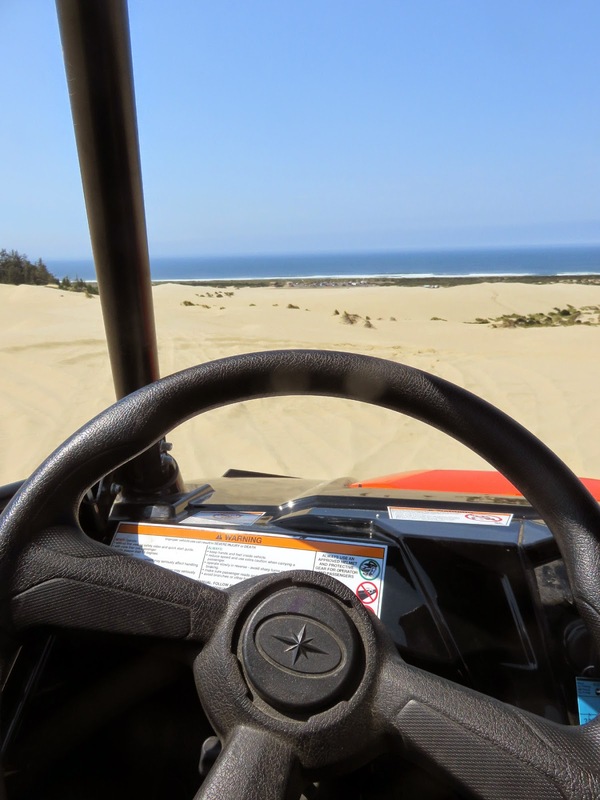 Finally, I'm blogging about Winchester Bay and our wild ride on the Oregon sand dunes. 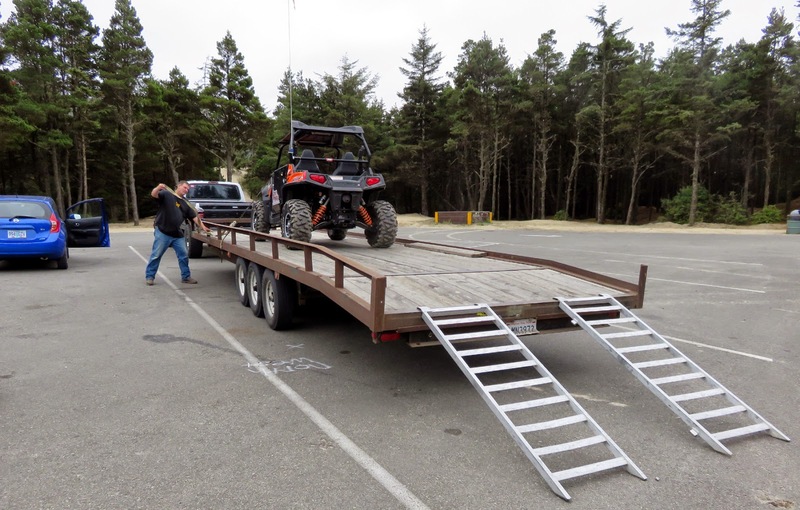 We rented a "razor" from a place called Steve's ATVs. One can describe this vehicle as something like a golf cart on steroids. 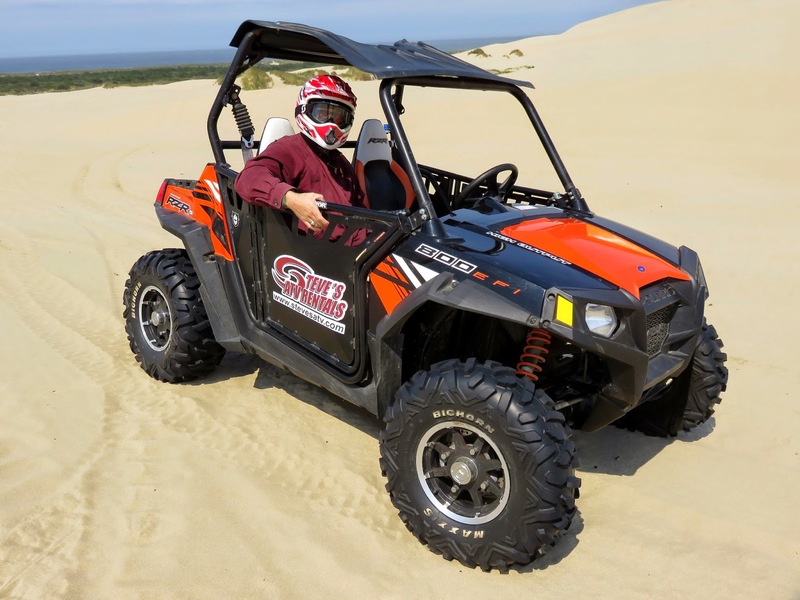 It will reach speeds of 60 mph and climbs giant sand dunes. (I never went above 30 mph!) We decided that riding apart had perils ... like the fact that we could lose sight of one another and that conversation wouldn't really be possible due to the noise from the engines and the helmets on our heads. 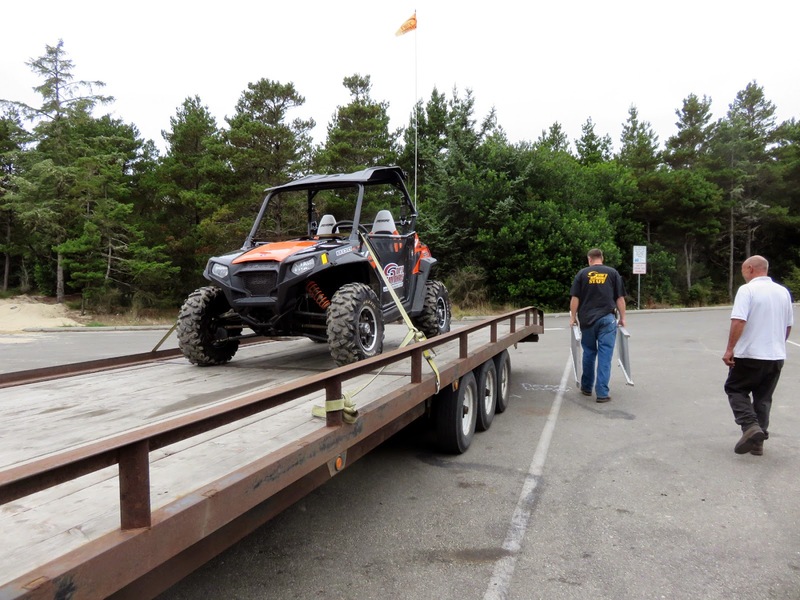 In the photo above, the "razor" is being transported from the rental company to the dune. I took the photo from our car as we followed it. ... with me behind the wheel. Well, it was much more scary than we'd imagined. Taking photos wasn't really possible. We had a total blast though even when we stopped at a nearby parking lot to use the bathroom. We didn't know how to open the doors and had to climb over them. I took advantage of the opportunity to shoot this photo of Steve still in the vehicle. Please notice, the razor is without its nine-foot flag. Why? We tried to navigate through the narrow trails in the lower dune area. It was an obviously well navigated path ... well navigated by people driving smaller/narrower ATVs. We sort of hit/scraped two small, scrub-like pine trees ... sort of scuffing up the driver's side rod (seen from the inside below) and lost the flag in the process. It is illegal to drive the dunes without a flag. We didn't even notice and were thankfully not caught! We were, however, required to return to the rental agency, pay for the $45 flag, and file a form (since leaving a flag on the National Park Services dunes is "littering".) Steve and I felt like two kids in the principle's office. The guy at the rental agency seemed a bit shocked. After all, we really aren't kids going airborne, jumping vehicles, risking our lives, doing dare devil stunts ... just two nearly senior citizens who happened to damage the razor. Thank goodness we bought the insurance policy! Once allowed to depart, we've been laughing ever since. This was my view from behind the steering wheel. One might think I should have noticed that the rod holding up the roof was scuffed up from hitting the tree ... but no! My eyes were trying to see over the dunes and I was laughing too hard! 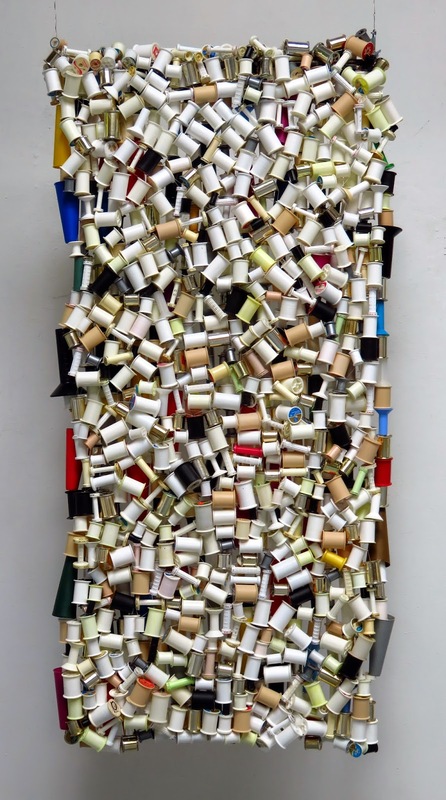 I am linking this post to Nina-Marie's "Off the Wall Fridays", a site for sharing fiber art work. I know there's not much "fiber" here (except a bit about the Portland Quilt Show) ... but I was stitching in the car and will be sharing this new project within the week! Promise! 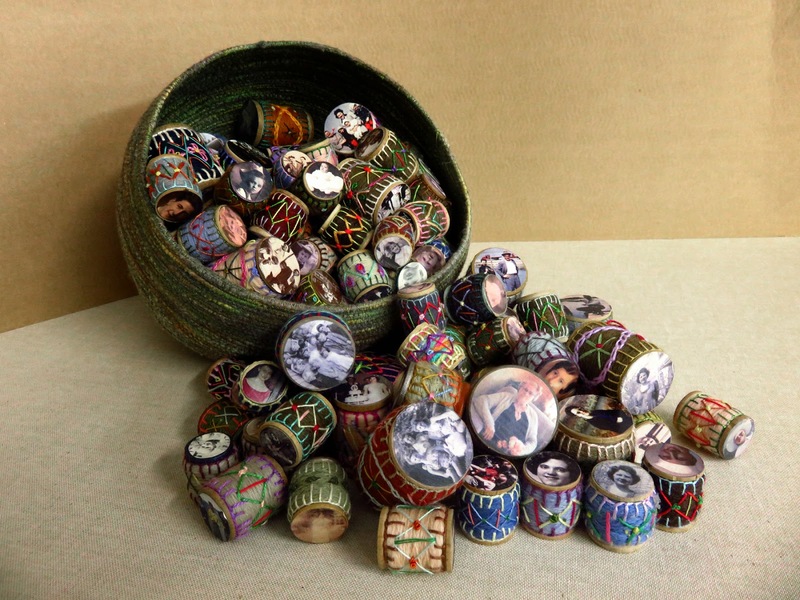 All the wooden spools have been successfully turned into wrapped-and-stitched "Ancestors". The photo above is a recent collection ... because I've sold two other collections over the past year or so! Making these tiny gems is definitely an obsession. Yet, I just couldn't bring myself to throw out all the plastic spools. The only spools that were trashed were the hard corrugated and paper ones. 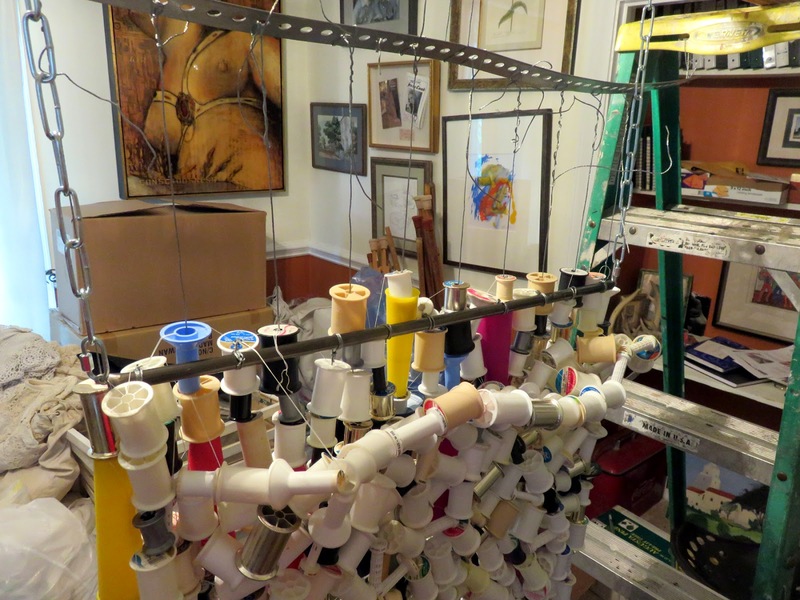 At first, I had no idea why I was saving all these plastic spools. 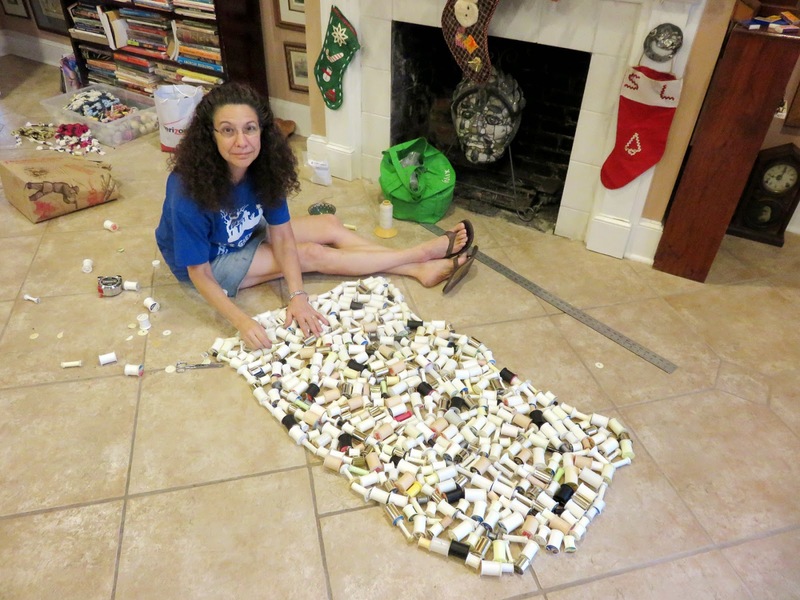 Finally, I had more than three Trader Joe's paper grocery bags filled with plastic spools and a hair-brained idea for using them. 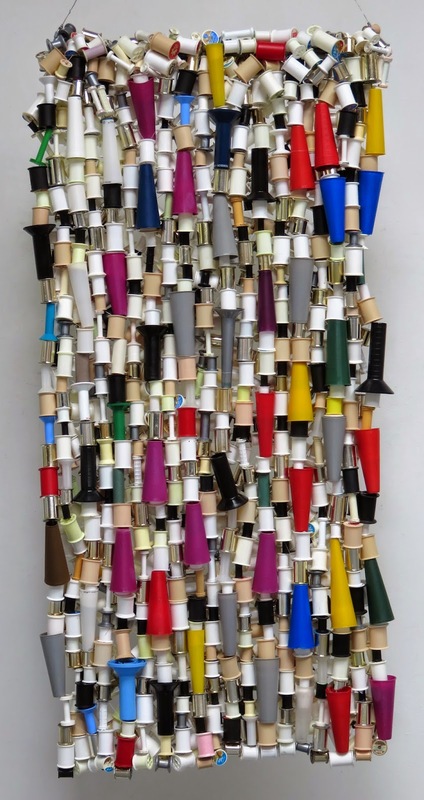 My idea stemmed from the knowledge that I could make a pretty cool, hippie-styled beaded curtain. That would have been easy! 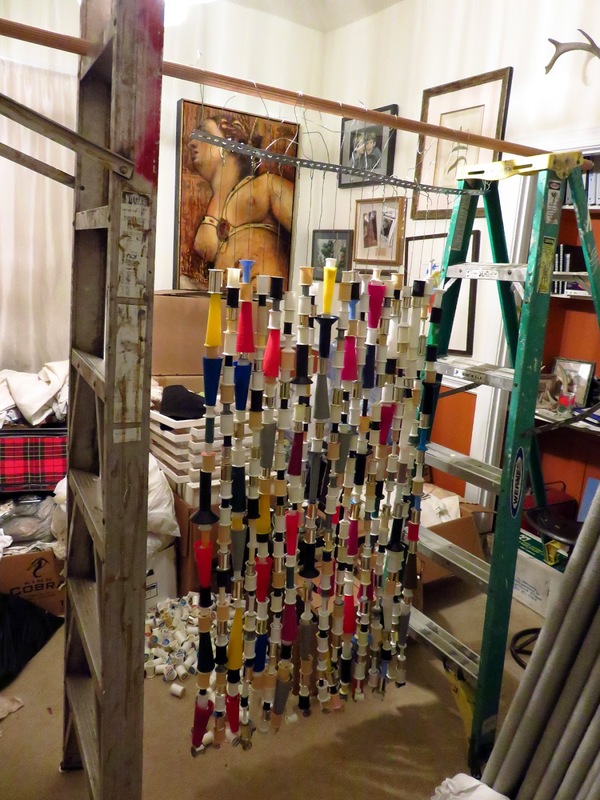 So, my plan was to stitch through the suspended strings of spools to make a "layer". Below are photos of how I managed to take individual spools and effectively create two layers that were then stitched together! 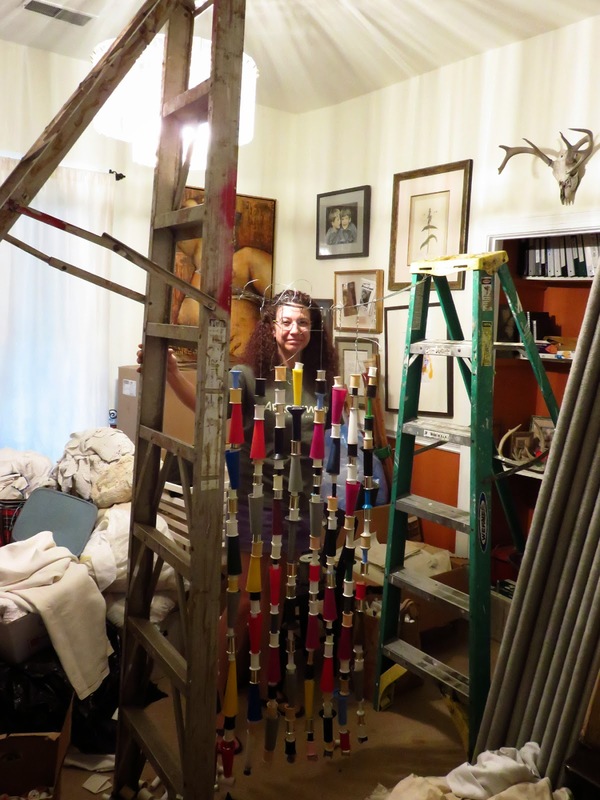 I used two ladders ... which were positioned at angles facing one another in order to create a nice, vertical space between them. The opposite ends of the ladders were placed on boxes and weighted. A metal strip was anchored between the two ladders. 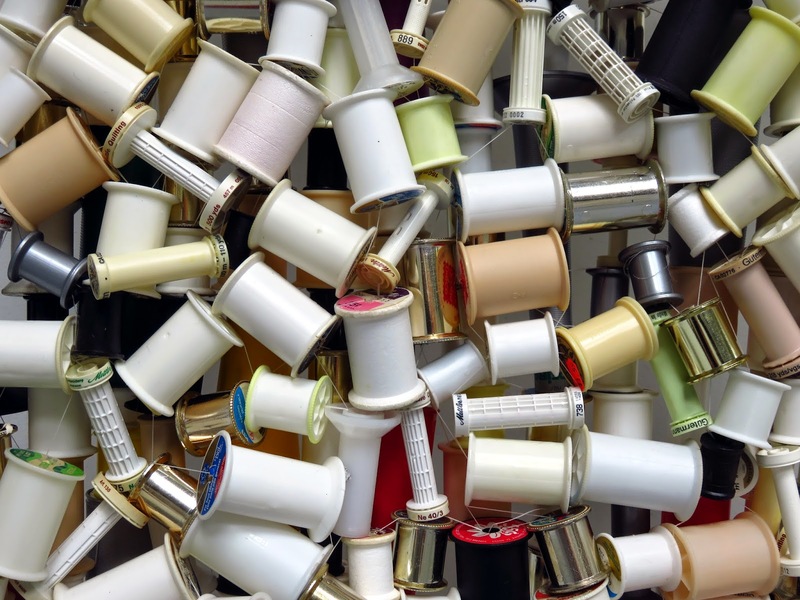 The wires on which the strings of spools were threaded were wrapped around the metal strip. This allowed me to use waxed linen thread and stitch from one spool to the next ... horizontally. By going from strand to strand and back again, the individual strands were completely linked ... into a "solid". 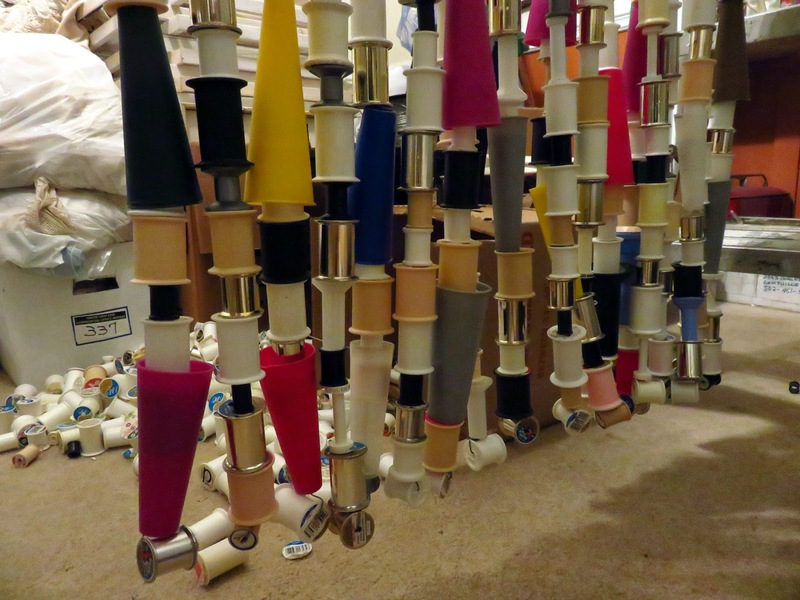 The second "layer" of spools was lots of fun to make. I threaded spools together, linking them in lots of directions ... using the waxed linen thread. It might have been great to make both layers like this ... but I really felt that one layer needed to have wire running through it for strength. 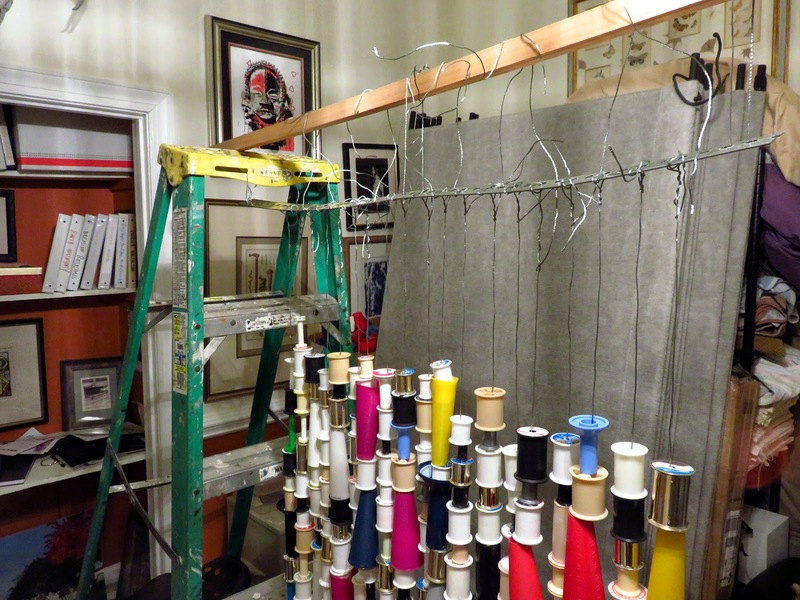 It was fairly strenuous to get the two layers together ... stitching back and forth between the spools ... linking "front to back". Although I attached the top at both sides, I worked mostly from the bottom up ... finally coming to the place where a hollow, metal rod could be hidden between the two layers at the top. One by one, the wires were attached to the rod. A very, very heavy wire was threaded through the rod. On each end I attached a small "quick link". In the photo above, I also had some chain attached to the "quick link". 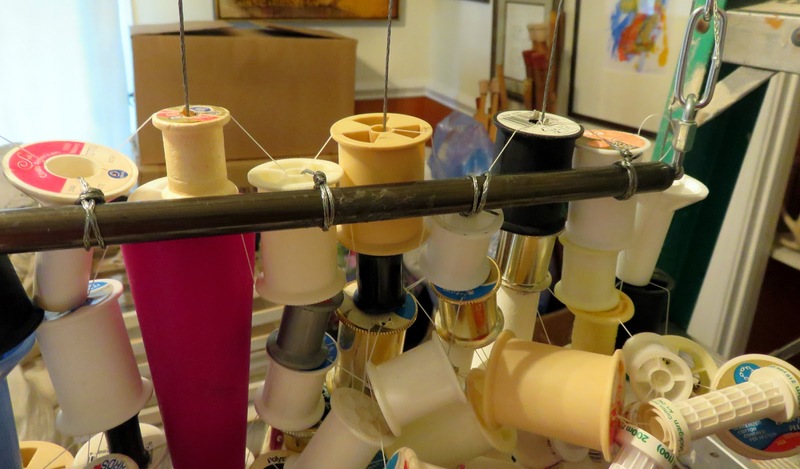 I added plenty of other plastic spools ... hiding the metal rod ... stitching "front to back" ... attaching the remaining wires to the rod ... until the quilt was only suspended by the two chains. It weighs plenty ... but it was easy to move to my studio, suspend it from an overhead I-beam, and take finished photographs of both sides. The work is meant to be seen "in the round". I'm really pleased that the hair-brained idea worked! I have a juried show to which I intend to submit this piece. Fingers are crossed that I get to make a shipping crate! I intended to finish this piece before the weekend but my wonderful great Aunt Janet died. Steve and I attended the memorial service in Huntington, West Virginia. I blogged about the experience on "My Family Blog" ... HERE. 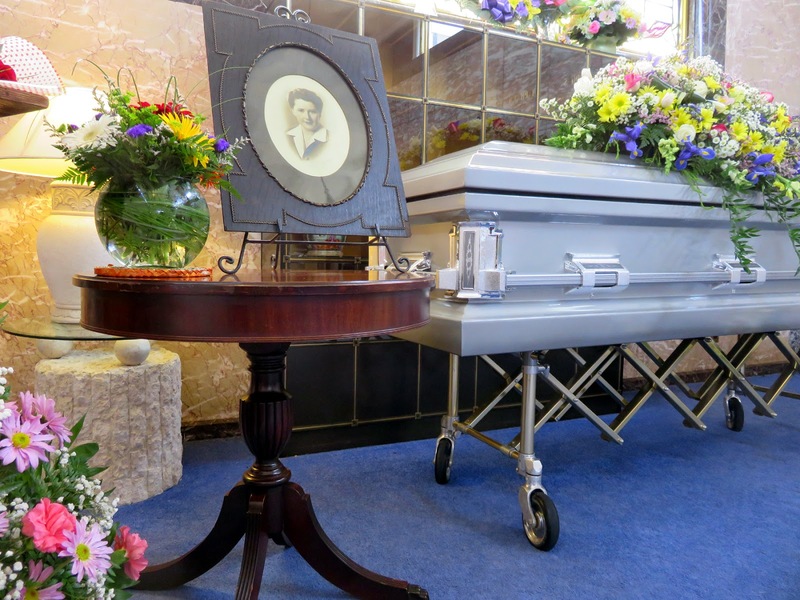 Aunt Janet was a fabulous, creative person ... who lived to 99 years of age! She was one of my role models and will be missed. Steve and I did make it back to Columbia in time for "First Thursday" on Main Street. My solo show, Last Words, was extended for another month ... which meant a second reception! 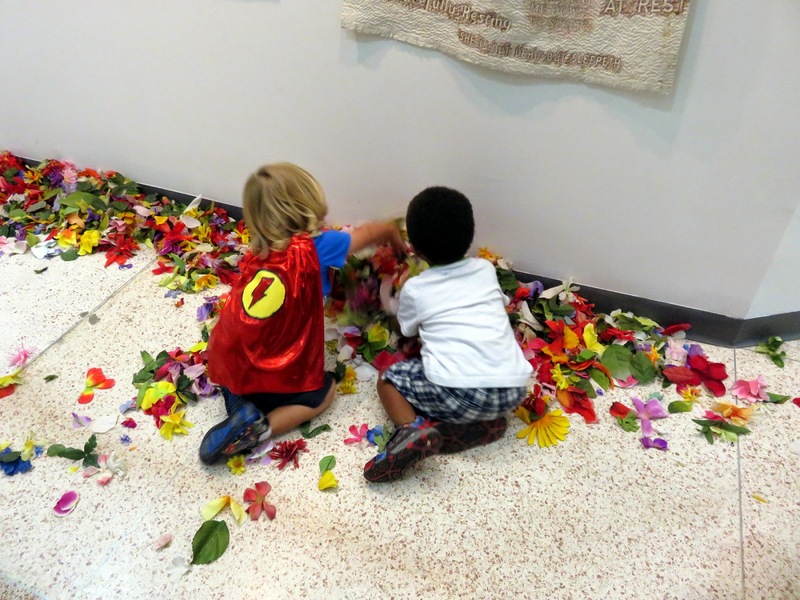 There were more people out looking at art this month than last month ... plus these two kids had a blast! For more about this show, CLICK HERE! 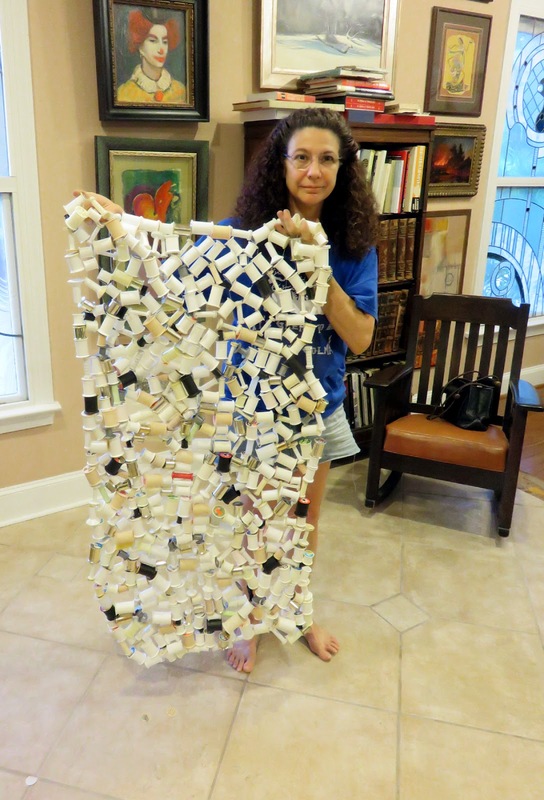 I am linking this blog post to Nina-Marie's "Off the Wall Fridays", a site for sharing fiber art works. 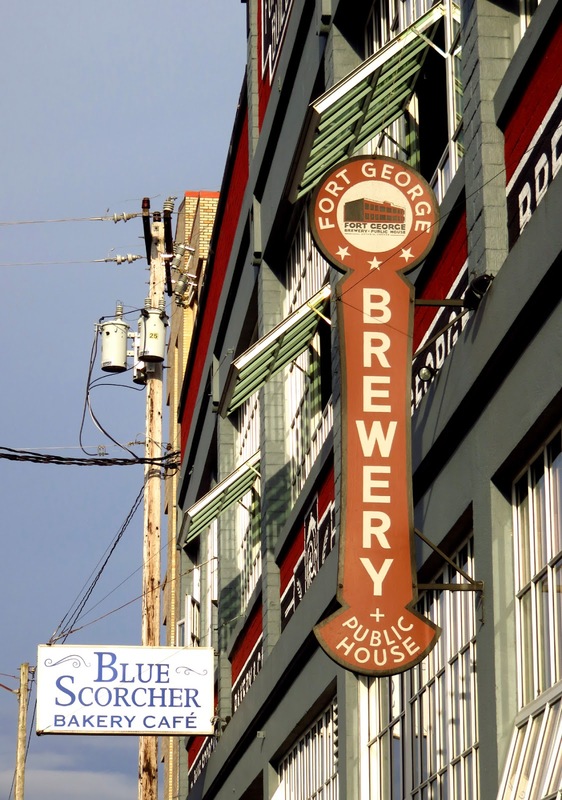 I'm actually doing this from Astoria, Oregon! Steve and I flew out yesterday. 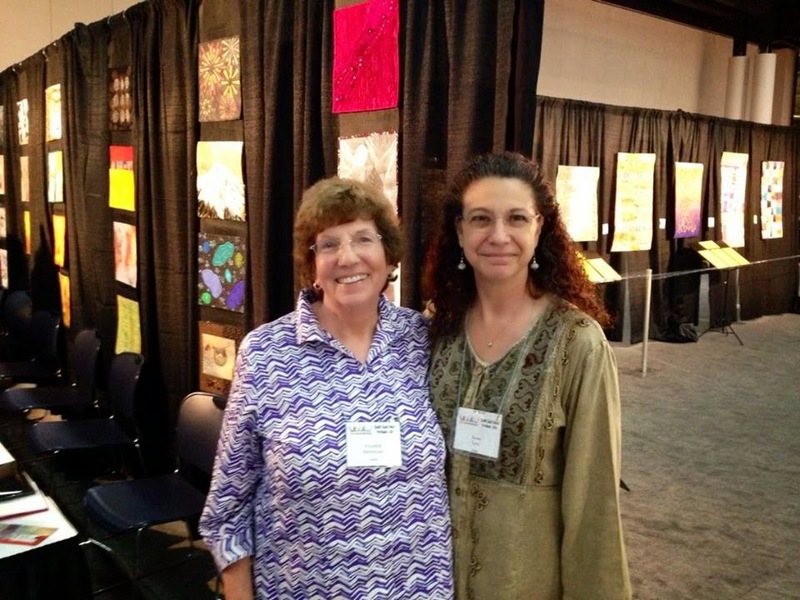 This morning we attended the International Quilt Festival's "Quilt! Knit! Stitch!" show at the convention center where I handed out information brochures and talked to people in the SAQA (Studio Art Quilt Associates) exhibitions, Text Messages and Metaphors on Aging. I have a piece in each of these juried shows. It was lots and lots of fun and I will be blogging about our western adventure next week!